Drunk, and driving a van down a Florida highway, Carter Clay, a Vietnam vet at loose ends, irrevocably shatters the lives of the Altiz family, killing Joe and seriously injuring his wife, Katherine, and their daughter, Jersey, in a hit-and-run accident. Horrified, Clay seeks redemption, while still concealing his culpability, by becoming the questionable caretaker of the two survivors' damaged lives--eventually imposing upon them the baggage of his past and his haphazard faith in God. 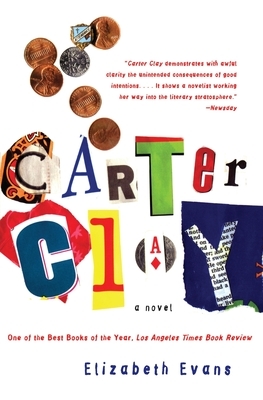 Suspenseful, psychologically complex, and inhabited by characters that will haunt your memory long after you have turned the last page, Carter Clay is a finely wrought tale of the frailty of identity and the possibility of redemption. Elizabeth Evans has received many grants and fellowships for her writing, including an NEA Fellowship, the James Michener Fellowship, and fellowships at Yaddo and MacDowell. She is the author of The Blue Hour and lives in Tucson, Arizona.